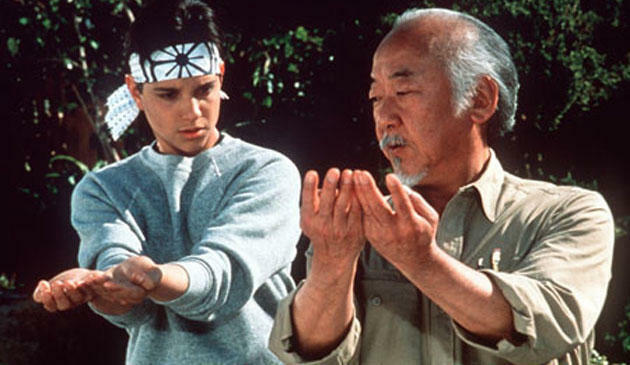 Mr. Miyagi and Daniel San, finding balance, in Karate and in life. The words above, "Be true to yourself, keep your balance" and "Rise above it" come from a dear friend in the Netherlands. These words are true, wise and old, but we sometimes forget. Life has a way of unbalancing us, of taking us away from our mission, our goals, our true self. People draw us into things we do not want to be a part of. Like being drawn into a foreign war we lose our true home. When we start chasing an annoying fly we lose track of what it was we were doing, our important life work. We must remember who we are and what our purpose is. We must maintain our balance. The two are totally interconnected. When we become distracted by a problem we chase it, we try to force a solution and we go off-balance. We get upset, we waste time. What my friend was saying was "Trust yourself, trust your life works. Do not let a minor nuisance take you away from your important work, which I recognize and believe in. Do not fall down to the problem, rise above it." And in the words of my dear friend Hal, "Keep doing what you are doing". There will always be distractions. There were always be hecklers. There will always be those who seek to find fault in you, criticize, accuse and condemn. Move on! Rabbi Kahane of blessed memory would say "They are like dandruff" and would make a sweeping motion on his jacket shoulder, as if wiping away the dandruff. He was never distracted by the Hecklers. And neither should we. Friends come and go, clients come and go. We must remain true to ourselves. We must not change to suit the needs of an individual friend or client. We must remain ourselves, for this is our mission in life. This is our gift. Do not give them the power, keep the power with yourself.